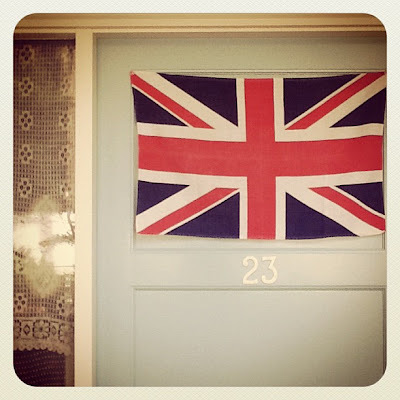 the tea towel flag is perfect! i'd leave it up for forever and a day too. It should be a great weekend here in Blighty, can you make sure we have some peachy sunshine? I will spot the jolly festivities from Germany via TV! The Union Jack tea towel on your door looks fabulous! Tif, it won't be the same without you but we will don our best clogs and pinnies, our stiff upper lips and look forward to your trip to Old Blighty at the end of the month when there will also be much rejoicing and awaving of flags Dottie Angel style! I do like that tea-towled door up there of yours. Jolly good!! Hope you're having a spiffy time with Rachelle, and book writing, and thrifting, and getting ready to come over here! OOoo, I can't wait I am SO excited for that crafty day to come around! I do hope that you and your clan of people and critters are well? ....and Scotland too? !lol Love the sentiment of the tea towel. Can't wait to read about the mischief,mayhem and madness! I can imagine you missing your spiritual home Tif! We had our 'main' party yesterday in the garden, it's so lovely to have extra holidays to make treasured memories!